for $419,900 with 4 bedrooms and 2 full baths, 1 half bath. This 2,998 square foot home was built in 1953 on a lot size of 1.060 Acre(s). 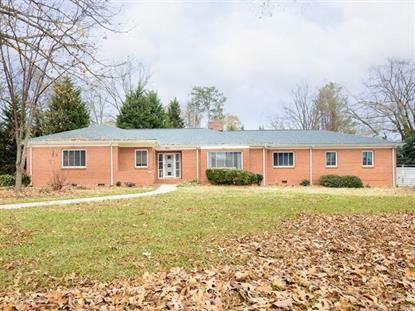 RARE FIND - Full Brick Ranch with Basement! Located on one an acre of land and corner lot! Attached 2 car garage with oversized driveway and detached 3 car garage/shop with oversized bays and is heated/cooled. Formal dining and living room with chair-railing, crown molding and oversized baseboards. Loads of Character! Large windows bring in lots of natural light. Cozy fireplace. Original hardwoods. Spacious bedrooms w/ample closet space. Freshly painted throughout. Master suite with dual closets. En suite bathroom with double vanity and stand up shower. Great room with built in cabinets/shelving. Open kitchen with built in wine holder, extra cabinet space, display shelving tile flooring and more! Enclosed patio area with oversized windows perfect for enjoying the Carolina weather! New roof and up fits in 2018. Great time to own already cash flowing asset with a commercial up side. All furnishings in home can come w/ approved offer. Please do not walk on the property without approval.